Devika received her B.A. in Psychology, with a minor in Environmental Studies from Binghamton University, State University of New York. 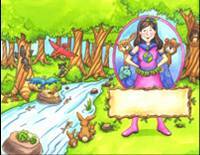 She continues fighting for the Earth as Project Coordinator with the World Resources Institute. Before joining the Climate Team, Devika spent two summers as an intern at WRI, where she provided communications and administrative support to the Governance Center. Devika Jaipuriar is an 11th grader at Glenelg Country School, envisions an outreach project to teach children the basics of environmental awareness. Earth Girl! is a comic book about a superhero who is trying to save the world from pollution. The comic book will be a launching pad for a broader program involving a tour of Earth Girl to elementary and middle schools to discuss environmental stewardship. “My Earth Girl project has made many strides,” recalls Devika. “By the end of 2008, the Earth Girl story was complete. After a few more minor corrections, the story was given to the illustrator. A few weeks later I received the black and white copy of The Adventures of Earth Girl. I always knew that the book would come out some day, but holding it in my hands gave me a surreal feeling. After the hours of work I had put into this project, it was finally coming alive. Without the generous grants given to me by the FFC program I would not have been able to reach this point. This entire process has been a great learning experience for me. I learned the importance of teamwork, communication, and diligence. However, the most valuable lesson I learned was about keeping faith. In July 2009 Devika will be in Delhi, India with her mentor David Weeks to tell Earth Girl’s story to the young children of Ryan International School and to discuss with high school students from the same school how one can transform one’s vision into reality with the support of a mentor. When Devika returns to her home in Ellicott City, Maryland she will work on fundraising to help support the printing and distribution of her Earth Girl story. Additionally she hopes to raise enough funds to make it possible to contract with illustrator K. Michael Crawford for the development of an Earth Girl coloring book for young children to be printed in the 2009 – 2010 school year. Devika will also work on scheduling more Earth Girl presentations for local elementary school audiences in the fall. 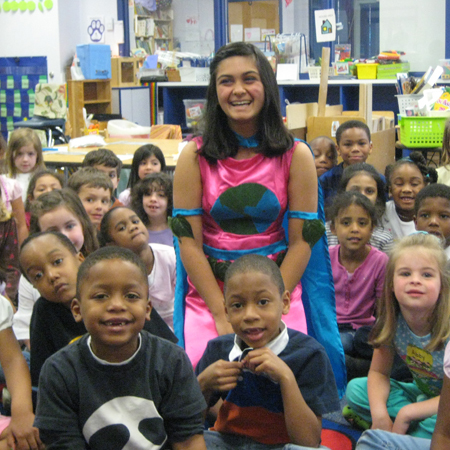 Devika has clearly made a positive difference in her world by promoting Earth Girl’s messages of healthy social living and responsible environmental stewardship to young children with her printed story and performances in elementary schools. My Earth Girl project has made many strides since the Kick-off event last November. By the end of 2008, the Earth Girl story was complete. After a few more minor corrections, the story was given to the illustrator. A few weeks later I received the black and white copy of The Adventures of Earth Girl. I always knew that the book would come out some day, but holding it in my hands gave me a surreal feeling. After the hours of work I had put into this project, it was finally coming alive. Without the generous grants given to me by the FFC program I would not have been able to reach this point. This entire process has been a great learning experience for me. I learned the importance of teamwork, communication, and diligence. However, the most valuable lesson I learned was about keeping faith. Because of the undying faith that Mr. Weeks, my parents, and all of the members of FFC had in me I was able to make this project a success. Faith is the fuel that has kept Earth Girl going and it will keep her alive for years to come. Watch this video about Devika and other grant recipients’ projects!